Small: 16 ½”/42 cm unstretched; up to 20”/51 cm stretched; approx 6.5”/17 cm deep. Large: 20”/51 cm unstretched; up to 24”/61 cm stretched; approx 7.5”/22 cm deep. Size S should generally fit small-med child; size L large child to adult. 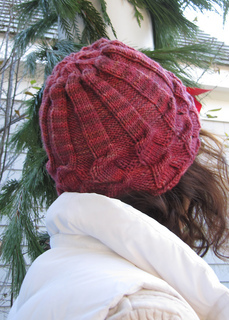 The crimped band of this hat is created by working stitches on the needle together with stitches picked up from a previous row (a variation on the stitch pattern “Folded Fabric,” from Reversible Knitting by Lynne Barr). These folds, and the rippled edge they create, form a flattering and comfortable frame around the face. Since the band does not grip tightly, this hat may not be a good choice for a winter gale; on the other hand, it won’t create severe “hat head,” either. The crimping (arriccia in Italian) adds a nice weight to the band, and an added fold, worked into the crown decreases, helps shape the crown. Worked in the round from the bottom up. 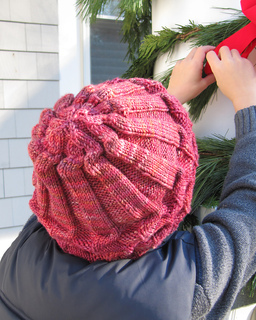 Intermediate: skills required include knitting in the round, pleating technique (similar to 3-needle bind off), and decreases. This pattern does not require charts. Yarn DK weight. With pompom: 275 yd/252 m (320 yd/294 m). Without pompom: 225 yd/205 m (275 yd/252 m). Shown in Madelinetosh Tosh DK (superwash merino wool; 225 yd (205 m)/100g), color Amber Trinket, 2 (2) skeins with pompom; 1 (2) skeins without pompom. 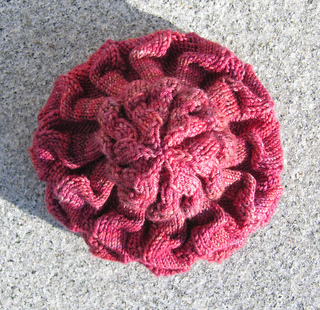 Small hat with pompom can probably be completed with 1 skein of Madelinetosh Tosh DK (above yardages include extra for swatch), but it will be close; large hat without pompom can possibly be completed with 1 skein, but it will be very close. NOTE: if substituting yarn, recommend choosing one which is machine washable AND can stand up to a few minutes in the dryer: since hat is unblocked, it will need to be “refreshed” in the dryer after washing, to retain its original size and shape. Needles 1 set U.S. Size 6 (4 mm) double-pointed (dp) needles; one U.S. Size 4 (3.5 mm) or 5 (3.75 mm) dp needle, for working Crimped pattern. approx 24 sts (2 reps) = 3 ¼”/8 cm in Crimped patt (unstretched). 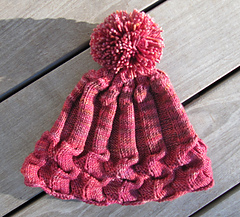 Hat is NOT blocked, thus measurements are on unblocked swatch. Note: Crimped pattern looks best when not overstretched; “stretched” measurements below represent not maximum diameter possible, but maximum diameter without distorting stitch pattern. Size S should generally fit small-med child; size L large child to adult.